3/4 Blue Cathedral Glass 5oz. 3/4" Blue Opalescent Glass 5oz. 3/4" Dk Green Opalescent Glass 5oz. 3/4" Lt Green Opalescent Glass 5oz. 3/4" Orange Opalescent Glass 5oz. 3/4" Pink Opalescent Glass 5oz. 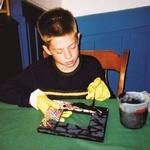 3/4" Purple Opalescent Glass 5oz. 3/4" Red Opalescent Glass 5oz. 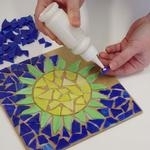 Mosaic Indoor Adhesive 8oz. 3/4 Dk Green Cathedral Glass 5oz. 3/4 Orange Cathedral Glass 5oz. 3/4" Blue Iridescent Glass 5oz. 3/4" Light Green Iridescent Glass 5oz. 3/4" Pink Iridescent Glass 5oz. 3/4" Purple Cathedral Glass 5oz. 3/4" Red Cathedral Glass 5oz. 3/4" Red Iridescent Glass 5oz. 3/4" White Iridescent Glass 5oz. 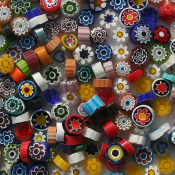 Aleene's Glass & Bead Adhesive Assorted Mosaic Millefiori 2oz. 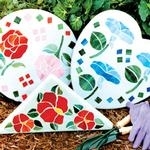 Mosaic Outdoor Cement 1 lb.. Mosaic Stained Glass- 1lb.